Traditionally when presidents and first ladies have lengthy travel schedules, the White House staff uses it as an opportunity to make more complicated adjustments, repairs and refurbishments. Depending on the rooms slated for new treatments there are laws, budgets and executive orders that demand compliance. As the White House is a home, a museum and a working office, certain designated areas require permissions of the Committee for Preservation of the White House, and/or the White House Historical Association. Two senior staff members are ex-officio participants of the decision-making committee, the Chief Usher and the Curator of the White House with the First Lady sitting as honorary chair. The White House Historical Association has an endowment championed by previous First Ladies, used for acquisitions and approval of changes to the state rooms. 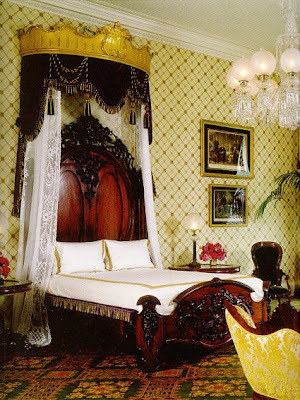 Laura Bush took the unusual step of inviting the WHA in 2005 to assist her in a detailed redecoration of the Lincoln Bedroom Suite located in the residence. The residence is a free for all zone subject only to the needs, desires and budgets of the first family. Congress in its generosity allocated a fund of $100,000 USD for all decorating needs for the first family and their offices. This year there is a new twist. The First Family will pick up the cost of any redo's or new do's. Typically, the president has major changes made to the Oval Office in the first 100 days to reflect his (someday her) style and choice of rug. Currently, the room is pretty much the way former president Bush had it. Since he is breaking ground on his half a billion dollar library in Texas, he is going to need his southwestern sunburst rug back for the display plus the two parsons chairs now in front of the fireplace. The spectacular rugs are pricey and can cost more than $60,000. Usually private donations defray these costs. Most libraries like the Reagan and Clinton presidential sites order a replica of the HMS Resolute partner desk to use in their recreated offices. 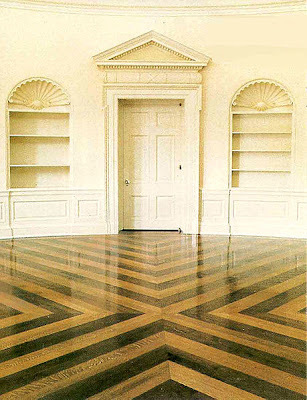 George Bush had the entire Oval Office taken down to the bare walls in 2005 to have new oak floors laid in their intricate pattern while he was out of town too. Other small symbolic changes have already occurred in the Obama Oval in the West Wing. The bust of Winston Churchill was sent back to the Brits, replaced by a bust of Martin Luther King, Jr. Time is needed to do new drapes that match a new rug. Pure speculation of course, but would love to see a fresh coat of paint and new furnishings for the most powerful office of state in the USA. The residence changes would go unremarked until private pictures are released by the White House. Two major areas that could really use Mrs. Obama's keen eye for style and stagecraft would be the official residence across the street, Blair House, and The Queen's "Barbie pink" bedroom suite. 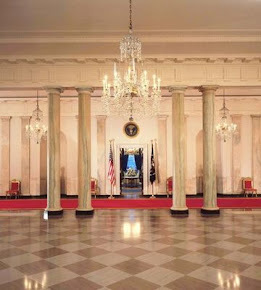 The so-called Treaty Room will also receive attention for a retrofit for an office for the president within the residence. 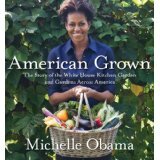 But first things boiled for Mrs. Obama. There is a huge annual event next week involving some brightly covered eggs, eager children needing refreshments and a giant bunny out on the South Lawn next Monday.